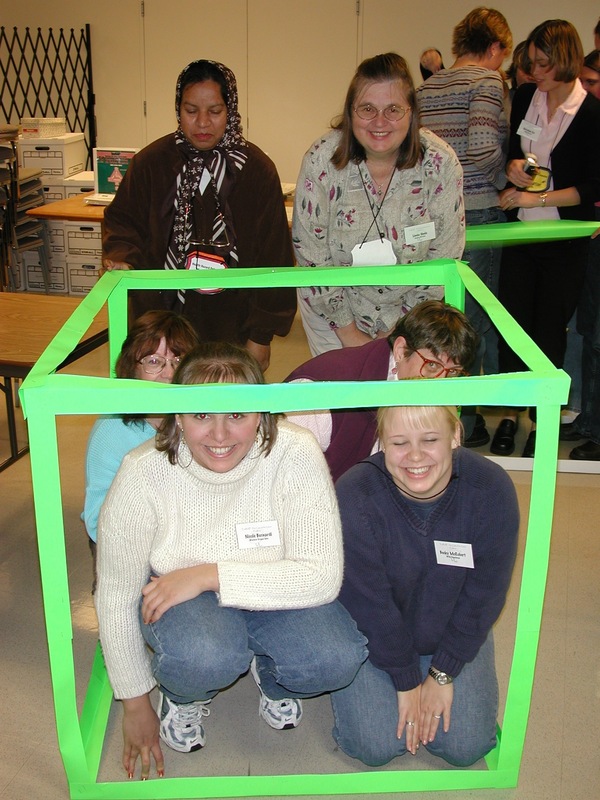 Objective: From the materials provided, build a box with your team that will hold a cubic meter of air. Show the American Academy of Allergy, Asthma, and Immunology website. Show a local page with the current air quality conditions. Illustrate that air quality is measured in cubic meters (m3). Relate the size of the cubic meter box to the air we breathe. A normal breath is 500 cm3. One cubic meter is 2000 breaths. An average person breathes 10-14 times a minute. It would take 3 hours and 20 minutes to breathe a cubic meter of air. The amount of air breathed by the average person typically ranges from 20-30 m3 per day. However, with heavy work and exercise this can easily exceed 50 m3 per day. Cut each sheet of poster board into seven strips. Each strip should be 4 inches x 22 inches. Cut a total of 24 strips. Fold each strip in half lengthwise. You may want to make the fold against a straight edge, such as a yard stick or meter stick, to get a good crease. Staple two strips together to equal a meter (39 1/3″) in length. Overlap the excess. This will make a stronger box. Do this for the remaining strips. You should have 12 one-meter pieces when you are done. Place four pieces on the floor in a square. Staple together the corners. Do the same fo another four pieces. Turn each square on its side. Staple on the remaining four pieces to make the rest of the cube. Reinforce with masking tape, if needed (this is also a good way to include more children, whether or not the tape is really needed).